Preheat oven to 425˚. 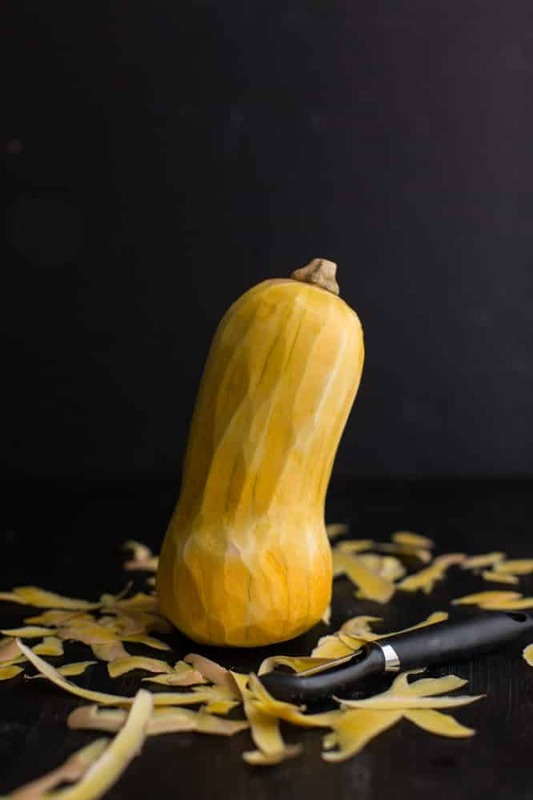 Toss butternut squash with olive oil, black pepper, and sea salt. Spread into a single layer in a roasting pan or on a baking tray. Bake until butternut squash is tender and lightly browning, 30-35 minutes. 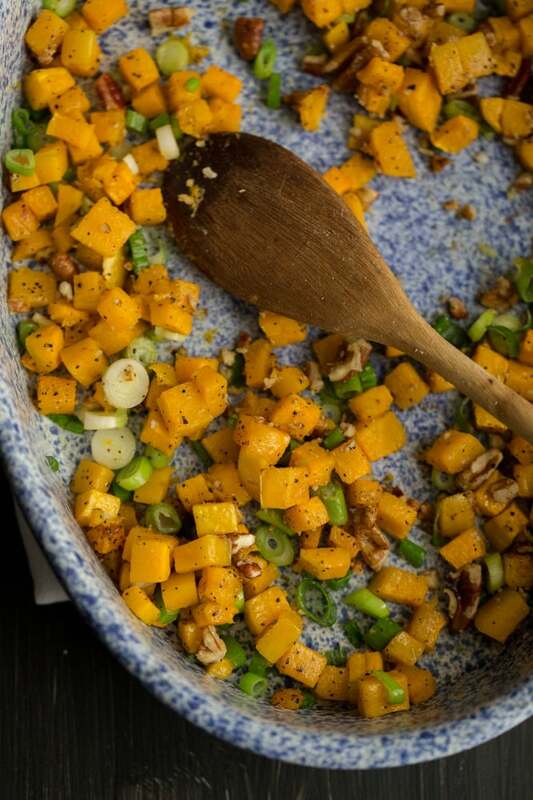 Remove from oven and toss butternut squash with honey and scallions until butternut squash is coated. Add in quinoa and pecans and stir. 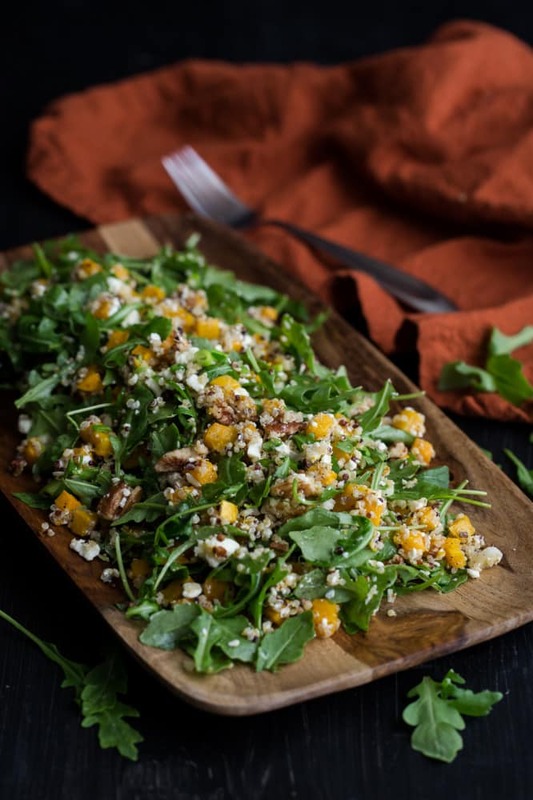 In a large bowl, combine arugula with butternut squash mixture and feta. Drizzle with olive oil and toss everything together. 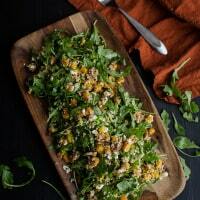 Warm, hearty grain salads are one of my favorite fall dishes! This would be so good for Thanksgiving. This looks amazing Ella – I love all the ingredients! This is definitely my kind of comfort food too. Looks lovely Erin! This looks great. I don’t understand the obsession with peeling butternut squash before baking because you can bake it with the skin, just like other squash. So much easier! Beautiful post! I am wondering what peeler you use as mine is not effective at removing the skin from winter squash. This looks fantastic! I love anything with butternut squash. This is comfort food for me too. Love the additions of scallions, pecans, and feta in this salad. I entirely agree with you – a bowl of a grain-based, squash salad in fall/winter has become my idea of comfort food as well. Before, I wouldn’t think twice about craving a grilled cheese sandwich or carby pasta, and now… It’s funny how being more mindful about what you eat can really change habits and tastes. Thank you for this! Love this – I got all the ingredients today and look forward to having this tomorrow. I guess one could also roast the squash in the oven first, before cutting and peeling it? Thanks for posting this recipe. Hi Ella, what a beautiful salad, I could eat this all day long. This salad is beautiful! 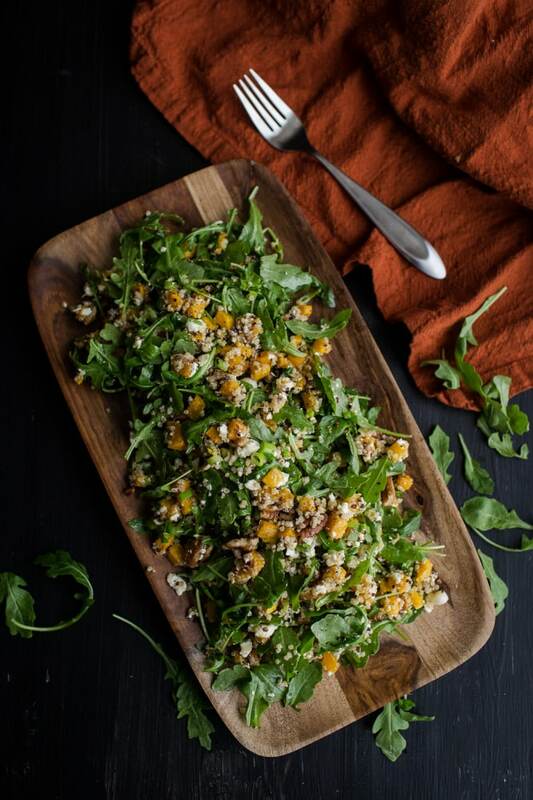 I love the idea of squash in a salad. The photos are stunning! I made this salad and left the feta out of my husband’s because he hates it. We loved it. I plan to make it again and take it to potlucks as well. Really yummy! This salad looks fantastic. I love that you used pecans in place of croutons – so much healthier! I just made this with left over quinoa that had dried fruit in it . It was so yummy! Wow! What a delicious combination of flavors and textures! This looks perfect for Thanksgiving! I’ve been looking for a new salad idea! This looks lovely, can’t wait to test it out! I LOVE this recipe! I have made it 3 times, and even got my finicky brother to try quinoa for the first time. It’s fall food perfection! I added some dried cranberries to this, plus a little balsamico and some pumpkin seed oil, and it was DELICIOUS!!!!!!!! This was delicious! Made it for dinner tonight and it was so good. Thanks for sharing!! does the arugula need some kind of light dressing at the end when its mixed with the qionoa? I didn’t find that it did- the olive oil was enough for me. However, you could easily mix up a simple balsamic dressing and add it! I work for a catering company, this is one of my favorite recipes to serve and our clients love it. We did add balsamic vinegar, it really bumped up the flavor. Thank you for sharing such a wonderful recipe!! !